The next private cargo mission to the International Space Station is slated to blast off March 1, NASA announced today (Feb. 14). The unmanned Dragon capsule, built by California-based firm SpaceX, will launch from Florida's Cape Canaveral Air Force Station at 10:10 a.m. EST (1510 GMT) on March 1 and arrive at the orbiting lab a day later. Dragon will carry about 1,200 pounds (544 kilograms) of supplies and scientific experiments to the station, NASA officials said. It will return to Earth on March 25, splashing down in the Pacific Ocean off the coast of Baja California with about 2,300 pounds (1,043 kg) of experiment samples and equipment onboard. The flight will be SpaceX's second contracted cargo mission to the station for NASA and third visit overall. Dragon first arrived at the orbiting lab on a historic test flight last May, then made its initial bona fide supply run this past October. 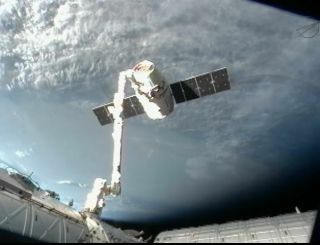 SpaceX holds a $1.6 billion deal with NASA to make 12 such flights with Dragon and its Falcon 9 rocket. The agency also signed a $1.9 billion contract with Virginia-based Orbital Sciences Corp. for eight cargo flights using the company's Antares rocket and Cygnus capsule. Orbital plans to fly a demonstration mission to the station later this year. The contracts are part of a NASA effort to encourage American private spaceships to fill the cargo- and crew-carrying void left by the retirement of the space shuttle fleet in July 2011. Dragon is in the running to ferry astronauts as well. In its latest round of commercial crew awards, NASA granted SpaceX funding to continue developing a manned version of Dragon. Boeing also got money for its CST-100 capsule, as did Sierra Nevada Corp. for its Dream Chaser space plane. NASA hopes at least one of these vehicles is ready to fly astronauts to and from the space station by 2017. Until such homegrown private spaceships come online, the United States is dependent on Russian Soyuz spacecraft to provide this orbital taxi service. The deadline for international applicants is 5 p.m. EST (2200 GMT) Friday (Feb. 15); for U.S. citizens, it's exactly one week later.